It’s that time of year again. The season of Christmas office parties. And if you have reached those dizzying heights in the office hierarchy it might be your turn to give one of the office party speeches. But no matter your experience of office party speeches they can prove nerve-wracking. Of course, it’s no matter that your expectations are set very high. Very high expectations for a great night out. Unfortunately, those expectations can be upset with an ill-timed or poorly delivered office party speech. So, here are 5 top tips to help you be more confident with your office party speech! Smile. Your Christmas office party speech isn’t the time to preview your New Year strategy. That would be too daunting–for your audience. So a big smile is the place to start. Then thank some people. Your party speech has to include all the necessary thankyous: the party organisers, Personal Assistants, Executive Assistants, caterers and bar staff. It should note a highlight or two from the year. And you’ve got space for some awards. Because, that’s about all the content you need for an office party speech. Be Brief. Brevity is best for your office party speech. A few notes is all you should aim for–either a few bullet point reminders on a card or a pictogram memory jog. Therefore, aim to speak for a few minutes at best before you move to the awards section. Speak before the drinks. So, aim to speak near the beginning of the party when people have arrived, had one or two drinks only and conversation is flowing. If dinner is being served aim to speak before dinner. Since this is not the best opportunity for an after dinner speech. Remember how a Mariah Carey speech was befuddled after drinks at the Palm Springs festival. Noise. With the best will in the world your office party will be noisy. Since that’s the idea. So you should have a microphone and speakers ready for your party speech. That way you don’t need to shout. And you can easily deal with the gentle heckles from your office manager. Oh, yes. Awards. The office party is a good time for some other thanks. Thanks for people or teams. When giving awards to people remember to get the technique right…with a list of three. For example, “And now, someone who’s always committed to the customer, someone who always puts their customer first, someone who it is a pleasure to work with…[pause]…first name, second name”. Applause will kick in spontaneously when you get it this way round. If you name the person and then keep talking the audience loses track of the applause point. And yes, you’re nearly there. But unlike your normal speeches, now’s not the time to field questions! That would spoil a party. Therefore, now is the time for a toast. So, round off your speech with a toast along the lines of…”To ourselves, To absent friends and To future possibilities”. Party…party. Relax and enjoy your office party. Bring on the New Year. 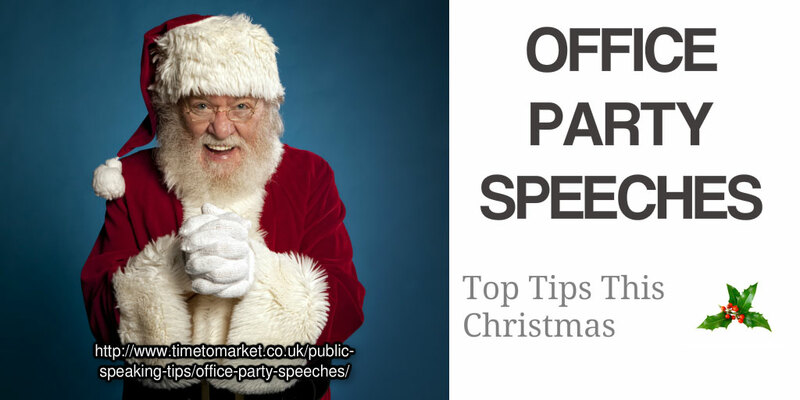 This festive period it pays to be ready for your office party, so here are five key tips for your office party speeches. Smile. You need to be buoyant for this speech. Be brief. Brevity is best for the office party speech. Speak before the drinks start to flow. Prepare for some noise ahead of time, so have a microphone if needed. Celebrate with some awards in your speech, because they always work. It’s brief, it’s friendly and it’s optimistic. It’s your office party speech this Christmas. You can find more presentation skills tips and techniques with presentation skills training on a PresentPerfectTM presentation training course or with one to one coaching. So, when the time is right to boost your public speaking skills, please don’t hesitate to get in touch.